Women and peace, men and war? Dutch radical feminist Wilhelmina Drucker’s take on feminism during the Great War. This article explores the connection between feminism and the fight for peace during the First World War. Although the Netherlands were officially neutral, the horrors of the battlefield, the position of women and the measures that needed to be taken were at the centre of a fierce political debate. I focus in particular on the special contribution to the Peace Movement by secularist feminist and leading figure of the nineteenth- and early-twentieth-century feminist movement Wilhelmina Drucker (1847-1925). Her criticism of the war spared neither men nor women and comprised three dimensions: an antimilitarist dimension, a legal democratic one, and an ultra-radical combination of feminism and Neo-Malthusianism. For the King, but in the name of the people. How the conservative Dagblad van Zuidholland en ’s-Gravenhage developed its populist traits. The Dutch conservatives in the nineteenth century used the concept of volkskoning (the people’s king) to legitimize their defence of royal prerogatives against the increasing power of parliament. This concept emphasized the bond between monarch and people and depicted the political elite as a threat to both. Based on a study of the conservative newspaper Dagblad van Zuidholland en ’s-Gravenhage, this article argues that the idea of the volkskoning was developed into a more populist argument in which the people became the de facto sovereign who had to be protected against the rotten elite in parliament. Piet Mondrian on neoplastic art education. Piet Mondrian (1872-1944) was not only a painter, but also a prolific writer. He wrote more than a hundred essays in Dutch, French, and English on the subject of art and society. In three unfinished essays, Mondrian sketches a different art education than was customary at the fine art academies during the interwar period. He describes an education that does not focus on creating discrete art objects, but on designing the entire daily environment. Mondrian’s intention was that graduates who had finished the training would give the society a harmoniously balanced structure, which would ultimately lead to more harmony and peace in man. He believed that a ‘Paradise on Earth’ would be no longer be a dream when all aspects of life were designed according to the neoplastic principles. In order to achieve this, students of Mondrian’s art education had to study the fundamental principles on which Mondrian based his neoplastic paintings. The present article investigates the principles of neoplastic composition as laid out in these three texts, which can help our understanding of the thought and method behind Mondrian’s Neo-Plasticism. Under Black Pete’s skin. Dark figures around the nineteenth-century Feast of Saint Nicholas. 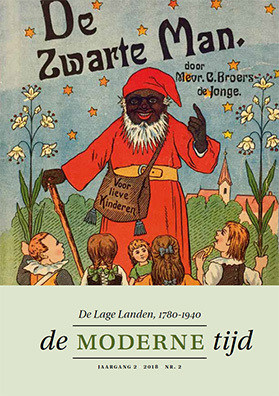 The Dutch debate surrounding Black Pete (Zwarte Piet) has become deeply polarized. Proponents as well as opponents of the black assistant of Saint Nicholas base their opinions on his assumed origin. While supporters of Black Pete believe that he originated from pre-Christian traditions, the anti-Black Pete camp is convinced he can be traced back to a world of slavery and racism. This article shows that the present figure of Black Pete is a nineteenth-century amalgamation of different types and traditions. This means that Black Pete can not be reduced to a single, unambiguous meaning. Therefore, the answer to the question concerning his identity and his alleged racist character must be found in his reception rather than his origin.